Over the past couple of months, I’ve put well over a hundred miles on the Montague Corporation’s Paratrooper. It’s been my choice of bike for commuting to and from work. I’ve used it both on and off road, and even jumped out of a C-130 Hercules. When folded, the Paratrooper could fit anywhere. Stick it in the closet for storage, in your trunk when on the go, or even inside the car. Above is a picture of the Paratrooper inside my Mustang. Anyone ever driven or rode in an ’85 Ford Mustang knows there’s hardly any space behind the driver seat. There’s even less space after the modification I did to it. 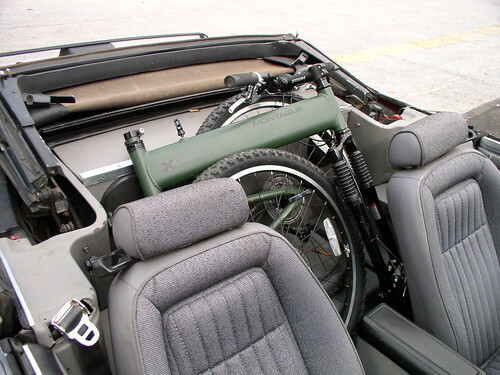 With the Paratrooper, there’s no need for a bulky bike rack. I’m really impressed with how well the Paratrooper rides. It handles well and takes off quick. It’s definitely one of the lightest mountain bikes I’ve ever been on. It’s such a pleasure riding; all my buddies try to borrow it when we go out for a ride. Montague Corporation thought of everything. The Paratrooper is a full size mountain bike that looks awesome, rides great, light weight, and folds. What more could you ask for? The paratrooper is the coolest bike I can think of. I have tried it myself. 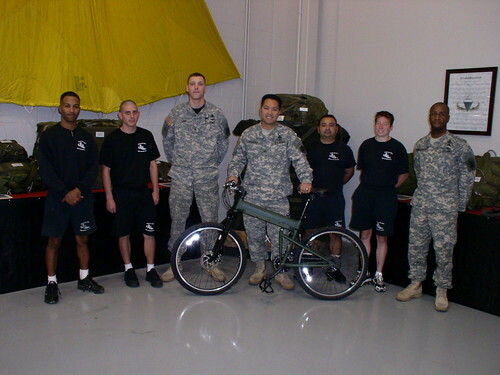 I wish I had this bike when I lived in the barracks, were space is high commodity. I could have used it a few month ago to my trip to Yuma. The coolest bike I can think of can fly and has a laser rifle mounted to the handlebars! And it leaves a rainbow trail! Are you trying to put CBB to a higher level again? The coolest bike I can think of has 600 gears, 10 spotlights, 25 rear blinking lights, 2 cupholders, and a handle bar mounted GPS. Jay: Don’t forget the heated saddle massager!! Jay: I picture you riding that around wearing a big white helmet with a rotating red police light on top. Handlebar-mounted GPS sounds rad, though. Not much need for it in a city you know, but for long distance trips, or touring? How tight would that be? I’ve had the idea rattling around in my head for a while to take a few days and ride up to New Hampshire (and you can bet I would not be taking my fixed-gear), and with a GPS it would just be that much more fun. I do ride with a GPS. A Garmin eTrex Legend as a matter of fact. Not only does it tell you where you are going, my GPS is able to save the route for later use. You can also download tons of data about your trip, speed etc, etc. If you are savvy in Excel, you can import the data and create nifty graphs. Check it out at http://www.thebikegeek.com/?p=49.